Born Jun 20 18492,3,7,8,9,10,11 [Jun - 18506], Randolph County, Indiana2,3,7,8,9,10,11. Hinshaw, Elwood, age 30, born in Indiana; father born in North Carolina; mother born in Indiana; farmer. Hinshaw, Hannah A., wife, age 29, born in Indiana; father born in New Jersey; mother born in Ohio; keeping house. Hinshaw, Stephen, son, age 3, born in Indiana; parents born in Indiana. Rhodes, Marion A., age 18, born in Indiana; parents born in Indiana; farm laborer; attended school. Hinshaw, Elwood, head-of-household, age [..unclear..], born June 1850 in Indiana; father born in North Carolina; mother born in Indiana; married 29 years; occupation: farmer; owned farm (mortgaged). 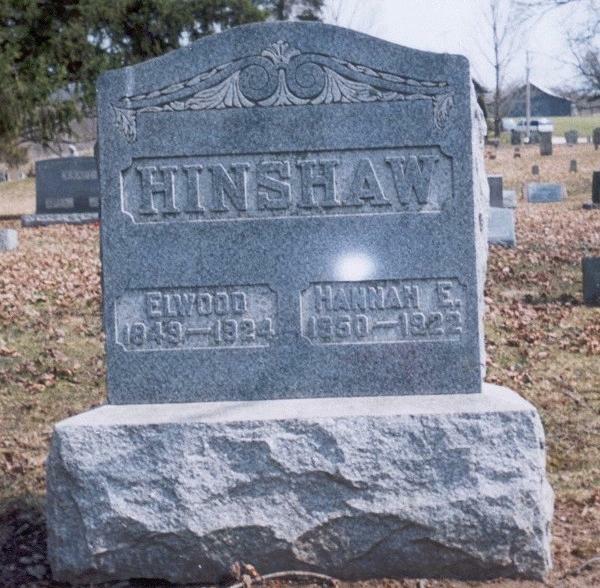 Hinshaw, Hanna E., wife, age 50, born Mar 1850 in Indiana; father born in New Jersey; mother born in Ohio; married 29 years; 2 children, 2 living. Hinshaw, Clement R., son, age 11, born Nov 1888 in Indiana; parents born in Indiana; attended school 6 months. Hinshaw, Ellwood, head-of-household, age 61, born in Indiana; parents born in North Carolina; first marriage, married 38 years; occupation: farmer; rented farm. Hinshaw, Hannah E., wife, age 60, born in Indiana; parents born in Ohio; first marriage, married 38 years; 2 children, 2 living. Hinshaw, Clement R., son, age 21, born in Indiana; parents born in Indiana; single; occupation: laborer, home farm. Hinshaw, Elwood, head-of-household, age 70, born in Indiana; father born in North Carolina; mother born in Indiana; owned home; occupation: farmer, genl farm. Hinshaw, Hannah E., wife, age 69, born in Indiana; father born in New Jersey; mother born in Indiana. 1900 census, Washington Township, Randolph County, Indiana; roll T623-399, ED 129, page 12A, line #39, dwelling #284, family #286. 1910 census, Washington Township, Randolph County, Indiana; roll T624-376, ED 142, page 164A, line #12, dwelling #47, family #47. 1920 census, Washington Township, Randolph County, Indiana; roll T625-464, ED 159, page 13B, line #73, dwelling #372, family #373. 1910 census, Washington Township, Randolph County, Indiana; roll T624-376, ED 142, page 164A, line #15, dwelling #48, family #48. 1910 census, Washington Township, Randolph County, Indiana; roll T624-376, ED 142, page 164A, line #20, dwelling #49, family #49. 1920 census, Washington Township, Randolph County, Indiana; roll T625-464, ED 159, page 13B, line #67, dwelling #371, family #372. 1920 census, Washington Township, Randolph County, Indiana; roll T625-464, ED 159, page 13B, line #85, dwelling #377, family #378.